Serve this wonderful prawn salad with a plate of beautiful prosciutto covered in sliced fresh figs, perhaps a big bowl of sliced tomatoes of all types garnished with torn basil and a few black olives, and maybe a shaved raw zucchini salad, dressed in the best olive oil and lemon juice, with lots of grated pecorino over it. Blanch the asparagus in a shallow pan of boiling water for 2-4 minutes, depending on the thickness – it should emerge with some firmness. Refresh under cold running water, then place on a clean tea towel to absorb any remaining water. Use a food processor to pulse the bread until chunky crumbs form. Place a pan on the stove over medium heat, pour in 60ml of the olive oil, add the breadcrumbs and toss until golden. Sprinkle with sea salt, remove with a slotted spoon and drain on a plate lined with kitchen paper. Cut the avocados in half and remove the stones. With a large spoon, scoop out each half, place on a chopping board and cut into 2cm dice. Mix the remaining 60ml olive oil and the vinegar together in a small bowl and season with salt and pepper. Put the lettuce in a large bowl, pour half the dressing over it and toss to combine. Arrange the lettuce on a large platter. 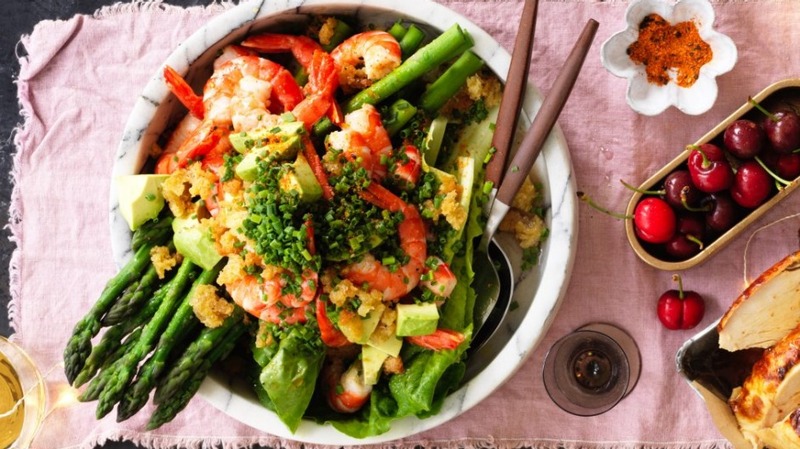 Gently place the asparagus and avocado on top and pour over the rest of the dressing, then put the prawns on top. Finish with the fried breadcrumbs, a sprinkle of togarashi, the chives and serve.